Please see the picture below my fish got this black spot how can this be finished. Is this a wild caught fish? And has it akways had this spot or has it recently showed up? 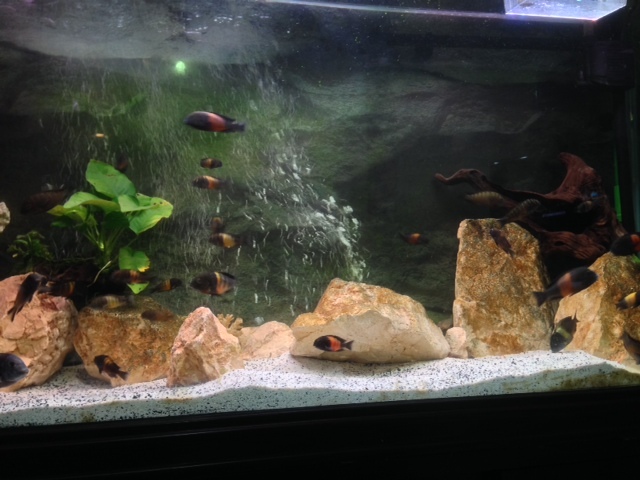 I bought recently from one improter a colony of ikola and bemba and both 1.5 to 2 inches young. they had them in the dealers shop and now i kept them in seprate tanks and our of 15 fish 5 had these and now its been 1 week + and the smaller dots are finished but the main big ones are still there. Can you post some clear photos of it? I have read that there is one type of infection that can cause black spots. But I cant seem to remember if its during the infection itself or a side effect of it. you think the small ones can be WC. I don't think that the rate at which they color up will determine whether they are wild caught or not. You would really need to know for sure the source that caught them. Also, at an inch and half, they are not wild caught. If a majority of them are coloring up early I would suspect that they are males. I have some Pemba fry that I'm growing out of my 2 WC females and they are about 1.5" and some of them are developing their stripe already. Orange and all. Okay, these are the best I could get out of the 100mph group with my Android phone. Black spot also call lake mark, usually caused by bacteria in the lake, even recover will still remain stain, they used to have on wild caught fish, but recently found on pond raised off spring as well. Nothing serious i think my tropheus has them as well.